We have some fabulous new details that were revealed ath IIFA Mumbai Press Conference. Something really exciting is the that the venerated actor, Anupam Kher will be honored with the prestigious ‘IIFA Award for Outstanding Achievement in Indian Cinema’ at IIFA Awards 2018. Kicking off the celebrations, IIFA Rocks 2018 will feature a musical extravaganza by acclaimed Bollywood music director-singer Pritam Chakraborty along with talented singers like Sreerama Chandra, Amit Mishra, Shalmali Kholgade, Antara Mitra, Nakash Aziz and Nikitha. Adding to the excitement, IIFA Rocks 2018 would feature stunning performances by Bollywood divas Sonu ke Titu ki Sweety Nushrat Bharucha and Vaani Kapoor. 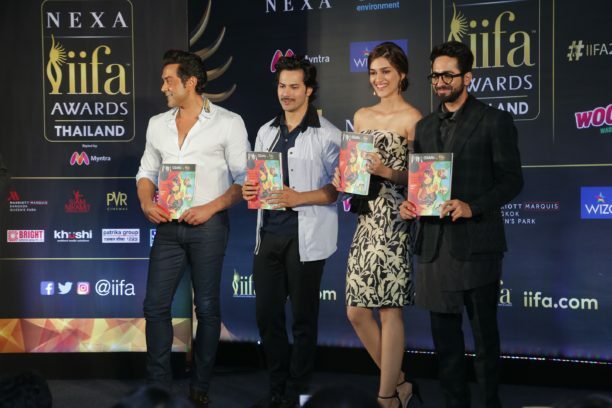 The grand finale of the 19th Edition of NEXA IIFA Awards, will witness mesmerizing performances by Bollywood megastars Ranbir Kapoor, Shahid Kapoor, Varun Dhawan, Arjun Kapoor, Bobby Deol, Shraddha Kapoor, Kriti Sanon, and Lulia Vantur. With the excitement growing across the world, the legendary actor Rekha is sure to leave audiences spellbound with her ethereal performance at the grandiose event. Additionally, as part of its commitment to preserving cinema heritage, this year IIFA Foundation will be collaborating with OSIANs auction house, India’s foremost Arts and cultural Institution & Auction House, to showcase vintage cinema memorabilia at an exhibition event which will be held at the Bangkok Marriott Marquis, Queens Park hotel from June 21st to June 23rd. A glimpse of the memorabilia was displayed at the press conference. Furthermore, IIFA has proudly partnered with Woosh Washing Expert, to support the cause of equality at home – ‘Barabari Ghar Se Shuru’. This partnership provides a platform to contribute and raise awareness for Women Empowerment and Gender Equality. For the fourth consecutive year, the IIFAs will be broadcast on India’s No.1 premium Hindi entertainment channel, COLORS with a stunning line-up of star-studded programming comprising of flashback episodes, IIFA Buzz, IIFA Rocks and the NEXA IIFA Awards. For the digital savvy viewers the same will be available on India’s leading video-on-demand platform, VOOT, from the house of Viacom18.